All our temporary plastic road signs are reflective and adhere to BS 8442 regulations. BS 8442 is the descriptive legal document regarding ‘Miscellaneous road traffic signs and devices - Requirements and test methods’. BS 8442 specifies legal requirements, and testing methods for rigid, flexible, portable and self-supporting signs. Not all road traffic sign suppliers are yet compliant with the incoming legislation. Anyone supplying signs that are not CE marked and compliant are in effect breaking the law. You are assured of signs that exceed these necessary quality standards here at Manchester Safety. 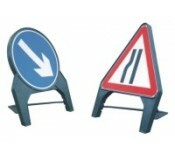 Q signs - Q signs are temporary plastic road sign manufactured from recycled material. They are sturdy but lightweight, incredibly strong and robust. These Q signs can be folded and stacked on top of each other easily. Different signals available include; men at work, road narrows nearside/offside, and both 'keep left' and 'keep right' Q signs. We also have rectangular Q signs containing multiple various instructions for road users (such as diversion direction indicators) pedestrians (such as directions for temporary walking/cycling footpaths during road works) or both (such as, 'ROAD AHEAD CLOSED' and 'CAUTION RAISED MANHOLES' signs). 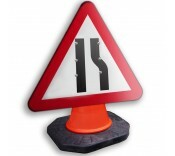 Cone signs - Our cone signs adhere to the same standard as the Q signs for road users and pedestrians, but these are signs are constructed for a one-piece robust plastic plate and have a sleeve attached on the rear. This sleeve is better than a hoop as they will not spin in the wind. The 600mm and 750mm cone signs include the usual chapter 8 signs such as roadworks ahead, road narrows, and keep left/right road signs. We also stock rectangular signs however the larger 1050mm x 450mm and 1050mm x 750mm sizes include to sleeves on the rear. The two sleeves (to fit on two cones) gives the signs greater stability. 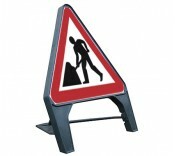 A 750mm or 1000mm size cone should be used which every size cone sign used.